The 11K route (same for both trail runners and canicross runners) is mainly off-road. The terrain is pretty good with only a couple of areas where it is a bit rutted. This event is in a beautiful setting. There is a stunning section of bluebells around 6Km. Being a little longer than the standard 10K run, this attracts middle and long distance runners as well as fun runners and walkers. There is a slow uphill drag for the first 2Km and another one at 4/5Km. Watch out for tree roots along the path. After that, it’s plain sailing (just one or two stiles). 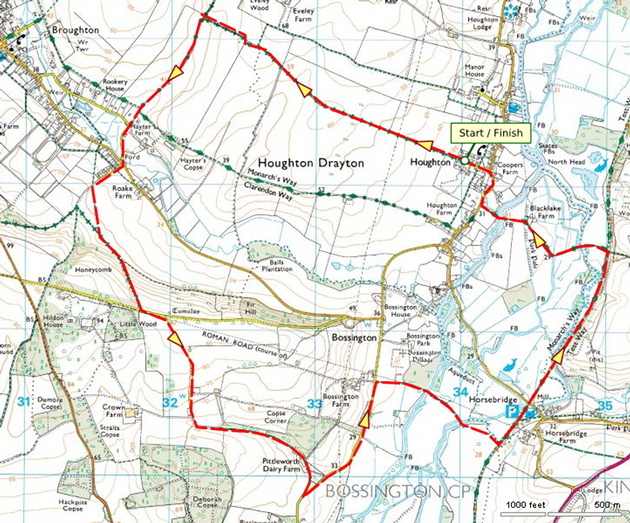 The run joins the Test Way around 8/9Km and The Clarendon Way at around 10Km. These are only approximate distance markers so don’t lap your watch by them! View elevation graph of this route on the raceroutes.co.uk website. Please note there is no policing at this event and we ask you to take the greatest care when running in traffic areas at road crossings and sections of tarmac (Beech Tree Walk and Bossington). There is a bend in the road where runners cross to get to the Finish at the Village Hall and although there will be several Caution Signs around we ask you to please be aware of traffic when crossing this road.